Stimulation of the Newberry EGS Demonstration injection well, NWG 55-29, began on September 23. Since then, we’ve successfully injected approximately 3,000,000 gallons of water into the expanding EGS reservoir. The first microseismic events associated with stimulation were recorded on September 28, and to date over 200 events have been located by the microseismic array (MSA). These events continue to be reviewed by seismologists as data streams in from the field. 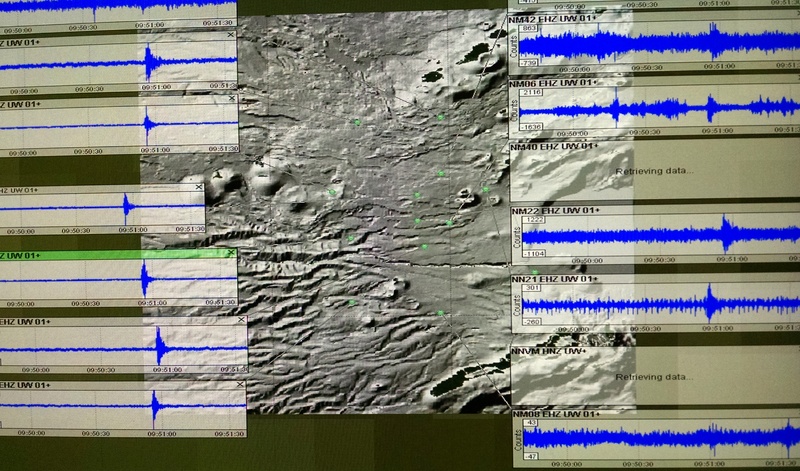 Data from a number of the MSA stations is available for viewing on the Pacific Northwest Seismic Network and the Lawrence-Berkeley Nation Laboratory website. The 15 station microseismic array (MSA) collects real-time microseismic data during stimulation. The data is used to map reservoir growth during stimulation. As a result of the Newberry EGS Demonstration, Newberry Volcano has been the most seismically-monitored volcano in the Cascades Range since 2012, when the MSA was installed. Over the next week, we’ll inject TZIM into the well, diverting water flow away from the current zone and forcing it out into other areas to further improve the reservoir. After stimulation is complete, TZIM will biodegrade leaving behind an interconnected, multi-zone EGS reservoir. Once the TZIM has biodegraded, the well will be flow tested; steam and water production and temperature will be recorded and used to analyze results of this year’s field work. TZIM, or thermally-degradable zonal isolation material (say that five times fast! 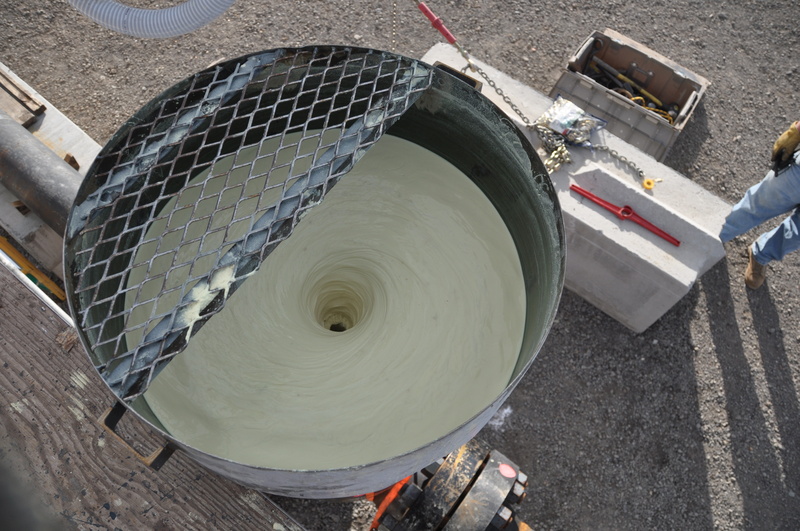 ), swirls into AltaRock’s injection hopper, or DIVA (diverter injection valve assembly). Biodegradable plastic TZIMs block open fractures in the EGS reservoir, forcing water out into new zones during stimulation. We’d like to extend a thank you to all those who participated in the Geothermal Resource Council’s Newberry EGS Demonstration site tour in late September. We had a great day in the field showing you the project site, and look forward to seeing you again soon! We also had a great weekend talking to visitors who stopped by our booth at the Bend Fall Festival last weekend. 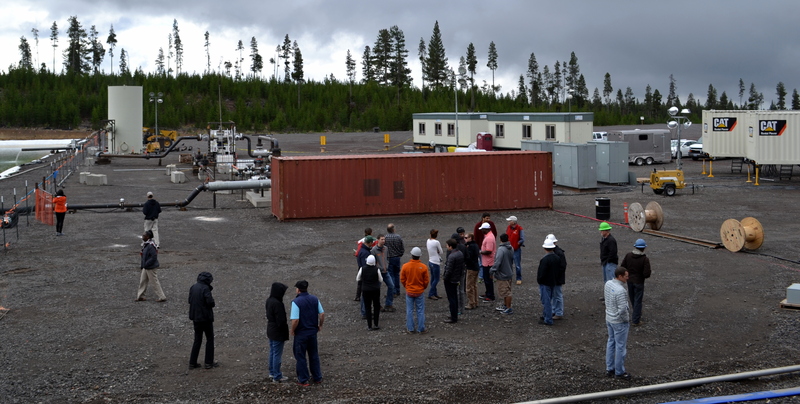 As part of the Geothermal Resource Council’s Newberry field trip, 24 visiting scientists, government officials, journalists, professors and others interested in geothermal research visited the Newberry EGS Demonstration site in late September just after stimulation began. AltaRock’s Dr. Trenton Cladouhos shows site visitors real-time data as it streams to the field office during stimulation at the Newberry EGS Demonstration site. Glad to hear guys. Best of luck (although I trust you’ve set things up well enough to make your own luck). I wish this project will be a great success! Thanks for hosting a very interesting GRC Fieldtrip. Good luck with your stimulation!